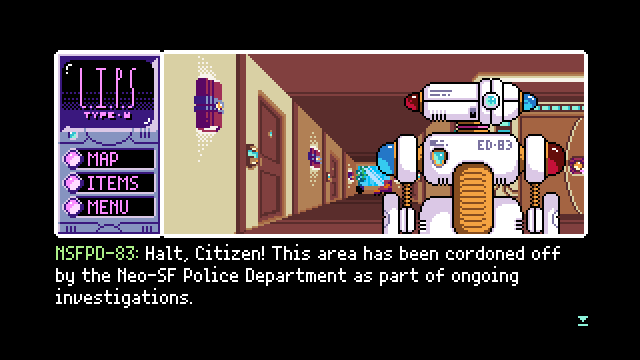 MidBoss's Read Only Memories: Type-M is an Android port of the PC game 2064: Read Only Memories. 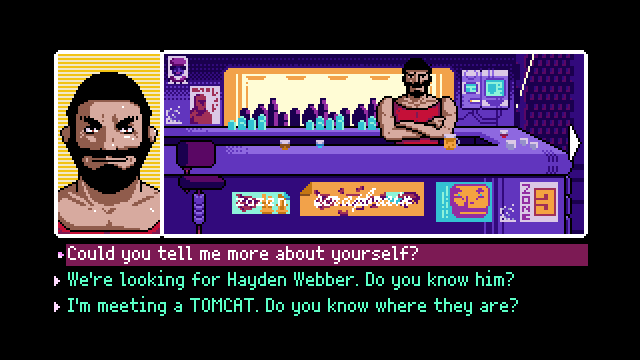 It is a tech-noir point and click adventure game inspired by the classic cyberpunk-themed graphic adventure Snatcher. It has been enhanced for mobile play by including an improved interface that is geared towards touchscreen devices. But best of all the first chapter is available for free, so you can test the game out before you decide to buy. The first thing I noticed after booting up the game is that very little of it fits the entirety of the screen, especially if you have an 18:9 device. It is much better suited for play on a tablet thanks to how the majority of the game sits within its own windows surrounded by a lot of black space. Shockingly there is no Android TV support despite what the Play Store lists. This strikes me as odd since the game already has console ports available. But forgetting the odd use of screen space and lack of ATV support the rest of the game is pretty great. The vaporwave soundtrack is simply fantastic and fits the tech-noir theme perfectly. The pixel-based graphics call back to a simpler time and nail the authenticity of a point and click adventure game that could have easily existed alongside Snatcher in the late '80s. Then you have the writing, which keeps the player invested thanks to the well-written characters, though there has been some concern over the heavy-handed use of politics that mirrors current trends. Now if you are familiar with old-school point and click adventure games, then the gameplay can be a little hit or miss. Many have stated that the puzzles can be on the easier side, though if you are not a seasoned player of this genre, you will probably find plenty of challenging content. As always it is great to see a solid port of a well-received console/PC game releasing on Android. The fact that you can try it out for free while also retaining the ability to purchase it in full for a single IAP priced at $5.99 is phenomenal and more devs should take note. If you are a fan of point and click adventure games that are well written, include a fantastically fitting soundtrack, and exude a ton of polish, then Read Only Memories: Type-M is most definitely an excellent choice.